Anonymous, Quantitative and *Historical Forensic Drug of Abuse Laboratory Testing using a Hair Sample. U.S. FDA cleared. Home Version Frequently asked Questions. The HairConfirm� personal forensic hair analysis drug of abuse testing service is the only at home hair drug test kit that provides a *history (up to several months) of current or previous drug use for the five most abused illicit drugs and drug categories: Methamphetamines including Ecstasy , Marijuana, Opiates, Cocaine and Phencyclidines (PCP) without the need for urine specimen collection. The only sample this hair follicle drug test requires is a small lock of the test subject's hair (approximately the size of a shoelace tip) taken at the scalp line. Confidential and non-invasive, The HairConfirm� hair drug test provides a qualitative determination of past drug use over a period of approximately three (3) months using forensic laboratory analysis. Online Sample tracking and report download direct from the Laboratory. The HairConfirm� hair drug test is FDA cleared for professional and personal home use. √ Online Laboratory Report can be downloaded and printed. * Historical determination of identified drug use is dependent upon several important characteristics of the hair sample submitted including but not limited to length (average growth rate of .5"/month for scalp hair), and proximity to the hairline (closest to hair root). Details of sample characteristics and requirements are discussed in the instruction manual included with this kit. The HairConfirm� kit is a forensic drug of abuse hair testing service cleared by the U.S. FDA. This test is completely anonymous. 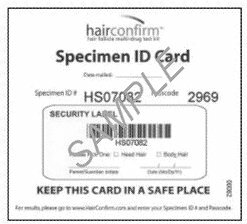 Each HairConfirm� hair drug test kit contains a special key code and password number which is the only information required to obtain the laboratory test results using either the online laboratory tracking service or the toll free number provided. Furthermore, test confidentiality is 100% guaranteed. No names or other personal identity information is used during the testing process, only the special code number test key. The HairConfirm� personal hair drug test provides forensic laboratory analysis for drugs of abuse that also provides a quantitative laboratory report that can be downloaded and printed directly online using the special code and password key provided with each test kit. Additionally a toll free number call in service for test results and counseling referrals is provided. Hair follicle drug test results indicate a negative or positive for each class of abused drugs tested for with quantitative readings expressed in pica grams per milligram for positive results. Results are generally available online within 2 business days after receipt of sample by the testing laboratory. Under certain circumstances, it may desirable to obtain a historical record of drug use. In-vitro urine and saliva drug test detection rates are limited to the metabolic half-life of drugs while in the body's system. Sufficient abstinence prior to a drug test can therefore produce a negative test result when in fact the individual has a history of drug abuse. Institutions and employers may want this information particularly in critical or sensitive occupations. 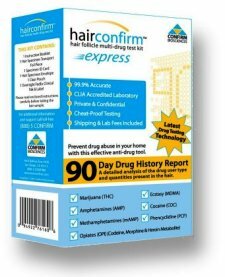 The HairConfirm� forensic hair follicle drug test service provides the same clinical results that can be obtained from a local medical or forensic laboratory, and the hair drug test is FDA cleared for consumer use, without the requirement of a physician's order and resultant potential invasion of privacy. All that is required for testing are strains of hair in an amount approximate to the diameter of a shoelace tip (40-50 strands). Sample hair is usually obtained by cutting a lock from the back of the head at the root line. Detection of historical drug use is dependent on the length of the hair sample from the root line. The average growth rate of hair is one-half inch per month. Therefore an approximate 90 day history of drug use would require a minimum of one and one-half inches of hair length measured from the root line. The HairConfirm� forensic hair drug test screen is very easy to perform privately and confidentially. All that is required is obtaining a sample of hair according to test instructions and returning the completed sample packet to the laboratory for processing using the postage paid return method (US First class mail: Standard and Standard Plus Prescription Hair Drug Test Versions) or FEDEX Priority Overnight (Express Test Version US Customers Only). Generally, results of the hair drug test are available within 2 business days after receipt by the laboratory (dependent on laboratory workload and scheduling) and are obtained online using the assigned unique test key code and user passcode included with each hair drug test kit. The completed laboratory report can be downloaded and printed directly online from the Laboratory. Results may also be obtained verbally using the toll free number provided. Reporting* Online. Download and Printed Report. 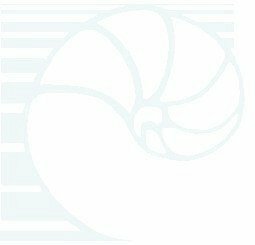 View Sample Report Online. Download and Printed Report. If the order buttons are absent or inoperable, please use the pricing overview page to order.